This high-quality I.D. tag (2170) is both durable and attractive. The adjustable design allows it to fit securely on all Littmann stethoscope models at the yoke area. The customer has the option to affix either a write-on or engravable name plate (both included in package). Once the name plate is secured to I.D. tag, it also serves as a name badge. We can now Laser Engrave a mark to the surface of the aluminum name piece with our in house YAG laser system. This permanent high quality mark will personalise your ID tag with your name etc and may ensure that it is returned to you if lost! The mark is laser engraved at 1200 dpi resolution which also ensures it looks great! This also makes an ideal personalised gift. Type in the text box below the engraving text you would like. Be sure to check it twice. What you enter is what we will engrave! The amount of characters available for the ID tag is indicated in brackets. If you would prefer no engraving then please leave this text box blank. this will be really helpful for your stethoscope to not be lost or mistaken from someone else's. 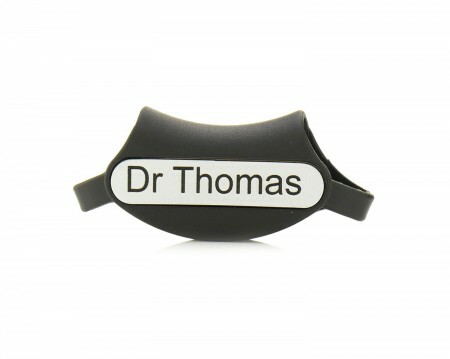 It is not fun to lose your stethoscope so hopefully with this on it and your name, you can decrease that chance by a lot! No one would want to lose their favorite Littman stethoscope. Great product to own. Price is lovely and the shipping is fast! As a nursing student with a tight budget, and already having a stethoscope stolen having this name tag will help to prevent my stethoscope coming up missing again. Looks like a sleek design I will definitely be ordering one! Nice item to have. Shipping was fast, and I love how they engrave the tag. No other company does this. VERY fast shipping, No problems, Awesome prices!